All the sysmoBTS we are selling have the OsmoBTS stack on them. OsmoBTS is a BTS implementation which supports connection to specific L1/PHY layers via different backends. 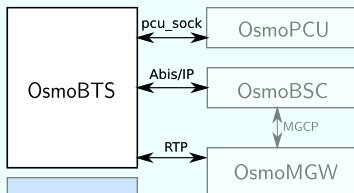 Towards the BSC, the OsmoBTS talks Abis/IP, towards the packet network it talks pcu_sock and towards the voice channels RTP is used. This makes it versatile for an all IP based setup. We are not just offering the OsmoBTS software as part of our sysmoBTS products, but also happily offer porting and system integration services to any other BTS or cellular PHY vendor who is interested in running the royalty-free Osmocom stack on their platform. More technical information can be found on Osmocom.